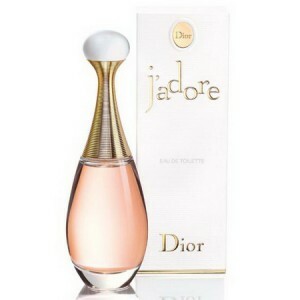 Christian Dior J'adore EDT is a luxury fresh, floral water from Christian Dior. Christian Dior J'adore EDT 100ml. - Dior fashion house creates luxury fragrances exclusively for women. And if before the goddess dressed in gold, they are now no longer just shine and conquer hearts outfit of white gold. Luxury collection of unique fresh flavors supplemented by another novelty: J'adore eau de toilette from christian dior. Fruity-floral composition of toilet water is a lot like its predecessors, but all the notes in it sound easier and gentler, more enigmatic and mysterious, enveloping her easy breathing. Top notes of mandarin, nutmeg and plum intertwined with floral bouquet "heart" in which opens all the subtlety of flavor, its ravishing luxury. Jasmine, lily of the valley, orchid, rose, violet - it is difficult to imagine a more feminine composition that would have sounded so organically on the body at any time of the day or night. Transparent "dress" J'adore edt long trail of musk, vanilla and plum perfect bright, cheerful, rebellious girls. But, despite the apparent lightness, Christian Dior perfume edt J'adore very durable and is ideal for those who prefer to shimmering and sparkling fragrance different notes throughout the day. Dior perfume creators wanted to emphasize the natural beauty and femininity owners of perfume, to express their sexuality and sensuality through subtle floral accords that will be flowing melody on a woman's body. Bouquets of flowers have always been harmonious addition of the female image, whether it is a lovely wedding ceremony or other celebration. Every woman likes to be surrounded by flowers, they create a special atmosphere around, to have dreams, set to a romantic wave and give a sense of happiness. With this in mind a small women's "secret" perfumer Calice Becker decides to create a personal bouquet for women J'adore - incarnation of absolute femininity! Aroma turned shimmering and sparkling, like the touch of sunlight that give the skin a luxurious golden glow ... Song: campaka flowers, violet, rose, orchid, candied Damascus plum, amaranth wood, blackberry, musk, vanilla.